Download "Appendix D lists the Field Services Standard Operating Procedures. 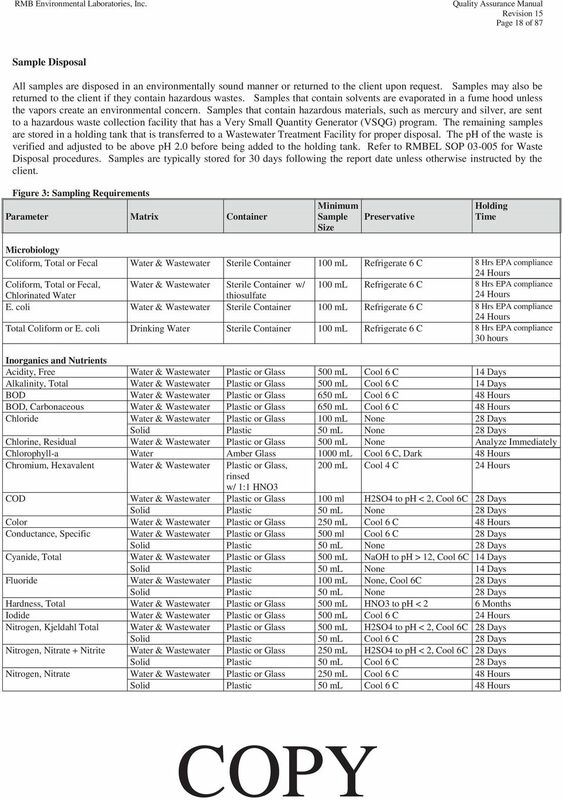 Appendix E lists the Biological Monitoring Standard Operating Procedures." 2 Page 17 of 87 individual determination, but to a large degree the dependability of an analytical determination rests on the experience and good judgment of the person collecting the sample. 3.4 Sample Storage and Disposal Sample Storage Prior to Analysis All samples are properly stored from the time they arrive at the laboratory to disposal. 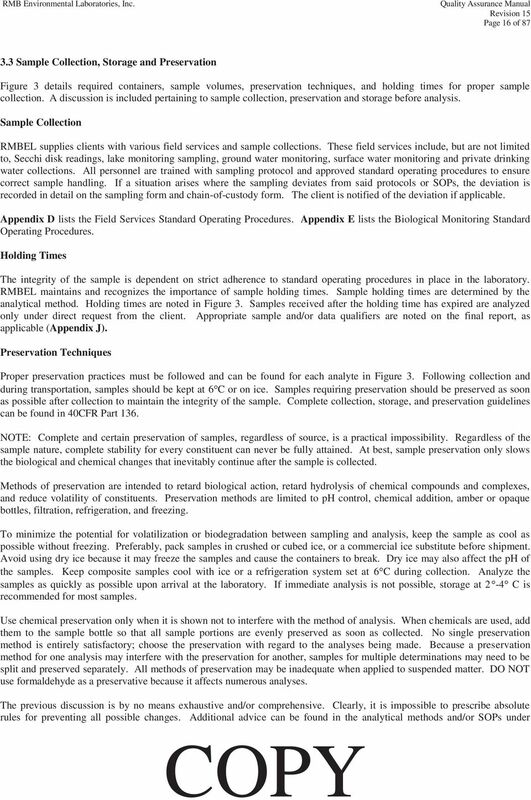 Samples are refrigerated at 4 C prior to analysis unless method SOPs indicate other storage conditions. Nature of Sample Changes: Some analyses are more likely than others to be affected by storage before analysis. Certain cations are subject to loss by absorption or ion exchange with the walls of glass containers. These include aluminum, cadmium, chromium, copper, iron, lead, manganese, silver, and zinc, which are best collected in a separate clean bottle and acidified with nitric acid to a ph below 2.0. This minimizes precipitation and absorption to container walls. Temperature, ph, and dissolved oxygen are best determined in the field. Temperature changes quickly and ph may change significantly in a matter of minutes. Dissolved gases (oxygen, carbon dioxide) may be lost very quickly. With the changes in the ph-alkalinity-carbon dioxide balance, calcium carbonate may precipitate and cause a decrease in the values for calcium and total hardness. Iron and manganese are readily soluble in their lower oxidation states but are relatively insoluble in their higher oxidation states, therefore, these cations may precipitate or they may dissolve from sediment depending on the redox potential of the sample. Microbial action may be responsible for the changes in the nitrate-nitrite-ammonia content, or decreases in phenol concentration. It may also be responsible for reducing sulfate to sulfide in Biological Oxygen Demand (BOD). Residual chlorine is reduced to chloride. Sulfide, sulfite, ferrous iron, iodide, and cyanide may be lost through oxidation. Color, Odor, and Turbidity may increase, decrease, or change quality. Sodium, silica, and boron may be leached from a glass container. Hexavalent chromium may be reduced to chromic acid. Biological changes taking place in a sample may change the oxidation state of some constituents. 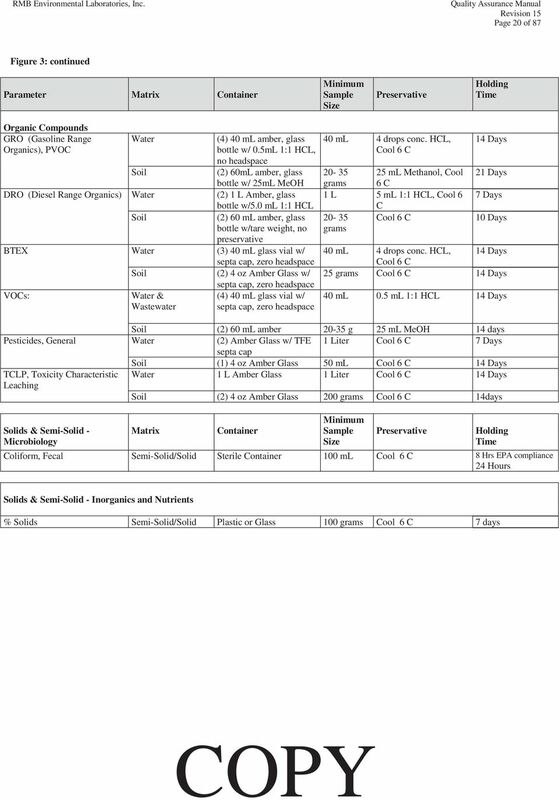 Soluble constituents may be converted to organic bound material in cell structures, or cell lysis may result in release of cellular material into solution. The well-known nitrogen and phosphorus cycles are examples of biological influence on sample composition. Zero headspace is important in preservation of samples with volatile organics. Avoid loss of volatile materials by filling sample containers completely; achieve this by filling the bottle until there is a positive meniscus before capping and sealing, being careful not to rinse out the acid preservation or come into contact with the acidified sample. Serum vials with septum caps are particularly useful in that a sample portion for analysis can be taken through the cap with a syringe. In general, the shorter the time that elapses between the collection of a sample and its analysis, the more reliable the analytical results. For certain constituents and physical values, immediate analysis in the field is required. For samples composited in the field, use the time at the end of the composition collection as the sample collection time. It is impossible to state exactly how much time may be allowed between sample collection and analysis. 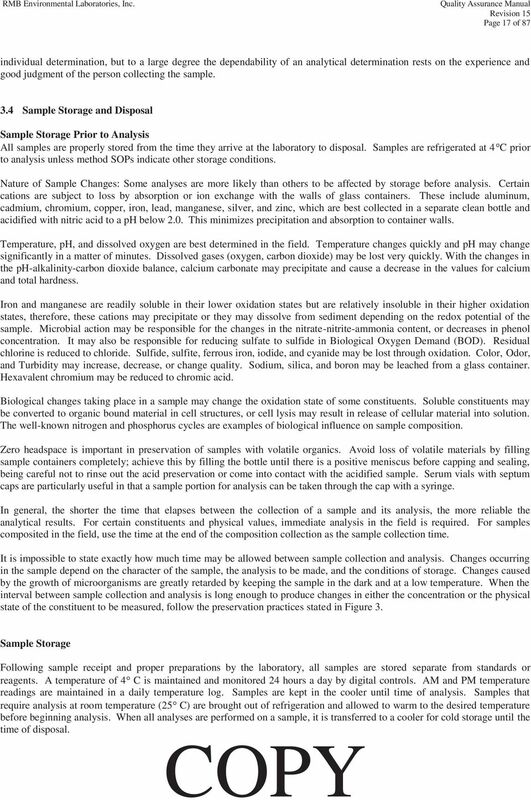 Changes occurring in the sample depend on the character of the sample, the analysis to be made, and the conditions of storage. Changes caused by the growth of microorganisms are greatly retarded by keeping the sample in the dark and at a low temperature. When the interval between sample collection and analysis is long enough to produce changes in either the concentration or the physical state of the constituent to be measured, follow the preservation practices stated in Figure 3. 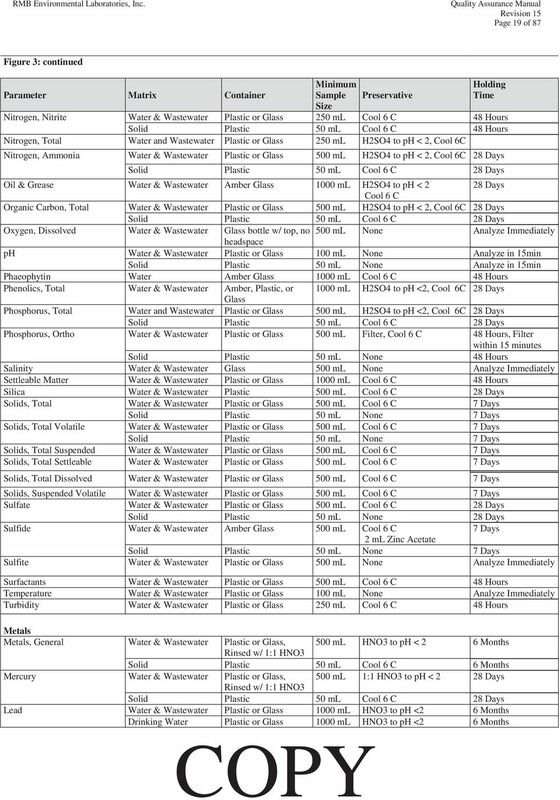 Sample Storage Following sample receipt and proper preparations by the laboratory, all samples are stored separate from standards or reagents. A temperature of 4 C is maintained and monitored 24 hours a day by digital controls. AM and PM temperature readings are maintained in a daily temperature log. Samples are kept in the cooler until time of analysis. Samples that require analysis at room temperature (25 C) are brought out of refrigeration and allowed to warm to the desired temperature before beginning analysis. When all analyses are performed on a sample, it is transferred to a cooler for cold storage until the time of disposal. Section A LABORATORY QUALITY ASSURANCE/QUALITY CONTROL. Her Majesty the Queen in Right of the Province of British Columbia 2013 All Rights Reserved. Proper chemical storage is required to minimize the hazards associated leaks, spills, and accidental mixing of incompatible chemicals. ICON Analyzer Dedicated online photometer for water and wastewater analysis Straightforward online water monitoring 02 If there is one thing that everybody depends on, it is water. We drink it every day.